Ahhh burgers, I don’t know anyone who doesn’t love a juicy patty between two buns and garnished with lettuce, tomatoes, and some condiments. Throw in some cheese and bacon strips and you’ve got a very tasty treat. The world loves burgers so much that McDonalds sells 75 of them every second! Doing the math, that equals 6,480,000 burgers a day! If you think how McDonald’s is just one of hundreds of stores worldwide that sells burgers, then you can imagine the immense number of burgers people consume every second of every day. There’s no number for how many burgers Jollibee sells but I’m pretty sure their sales of yum burgers are pretty high as well. If you’re on a quest to find the world’s biggest burgers, then let’s look to the fine folks from the Guinness Book of World Records to see which one holds that honorific title. 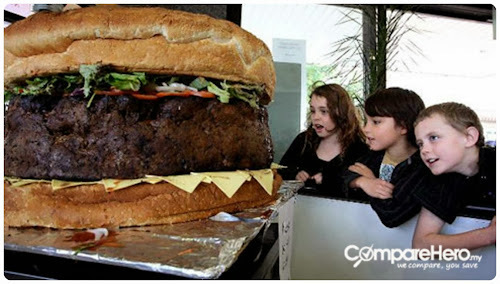 According to the records, the world’s largest hamburger was prepared by Black Bear Casino Resort in Carlton, Minnesota. The hamburger weighed 913.54 kg or 2,014 lbs and required a crane to flip it. It’s that huge! 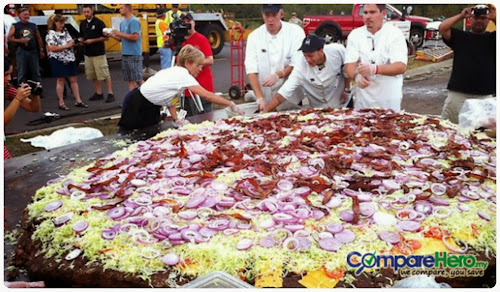 The record holder measured 10 feet in diameter and was topped with close to 24 kg of tomatoes, 23 kg of lettuce, 18 kg of cheese, and 7.5 kg of bacon. The burger was made in September 2012 so I say it’s time for someone to challenge this record. I’m crossing my fingers that they attempt the record again near my hometown because guests got to enjoy the record-breaking burger for free! Since you were probably not there to scarf down a piece of the world’s biggest burger, where should you go to satiate your appetite for humongous burgers? Guinness also has you covered and their index finger is pointing you to go to Juicy’s Outlaw Grill in Corvallis, Oregon. 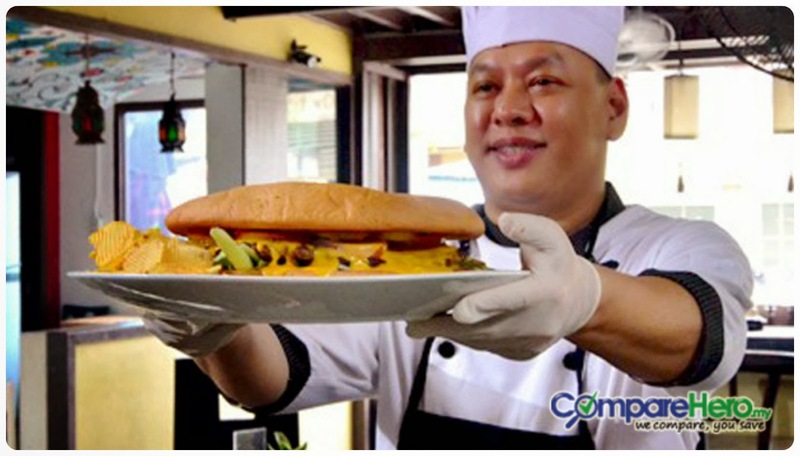 The restaurant serves the Guinness record holder for the largest hamburger commercially available. 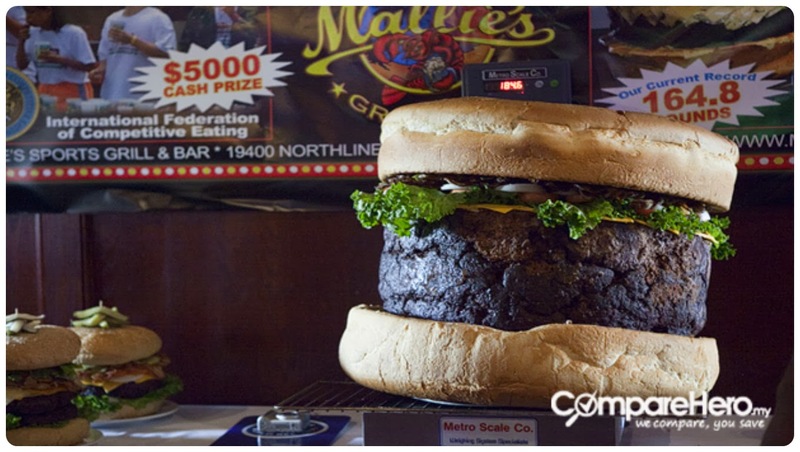 You should call two days ahead if you plan to bring a few friends with you to partake of the 352.44 kg burger. Be prepared to shell out a small fortune for the honor of cutting into an enormous hamburger patty because this record holder costs $5,000. If that’s too costly for your debit card, perhaps you could settle for other burgers that are not as ginormous but are still huge enough to be shared among friends. You and your buddies can head on over to Mallie’s Sports Bar & Grill in Southgate, Michigan. You may have seen this bar featured on Man Vs. Food and other TV shows like Food Paradise and Modern Marvels. You can order a 186 lb (85 kg) burger at Mallie’s for $400. You could also splurge and order this burger to have it delivered to your home for $2,000. Call 24 hours in advance if you want to taste this humongous burger. Flying all the way to the U.S. just to take a bite out of a huge burger may not fit anyone’s budget. Closer to home, there are several hamburger joints that are offering over-the-top burgers that will challenge Jollibee’s Champ and McDonald’s Big Mac. You could go to Woodfire Grill Republic in Metrowalk in Ortigas Center, Pasig City to sample The Monster Burger with your friends. This hamburger has got everything you could expect from a burger including onions, tomatoes, and ketchup, but what sets it apart from the Champ and the Big Mac is its size. The 10-inch burger can surely feed not just you but a whole bunch of your friends. You could also check out Murray and D’Vine’s Beef Bleu Cheese Burger if you want to sample something extraordinary. Take your date to the Ground Floor of Serendra in Bonifacio Global City to get a taste of this fancy burger. I hope that satisfied your question on where to find the world’s biggest burgers. The only question left to ask is… do you want fries with that? Article Written by Cristina Beltran – a blogger & writer at comparehero.my, Malaysia’s leading comparison website. This portal helps individuals in making the best decision by comparing rates from different finance and insurance providers.